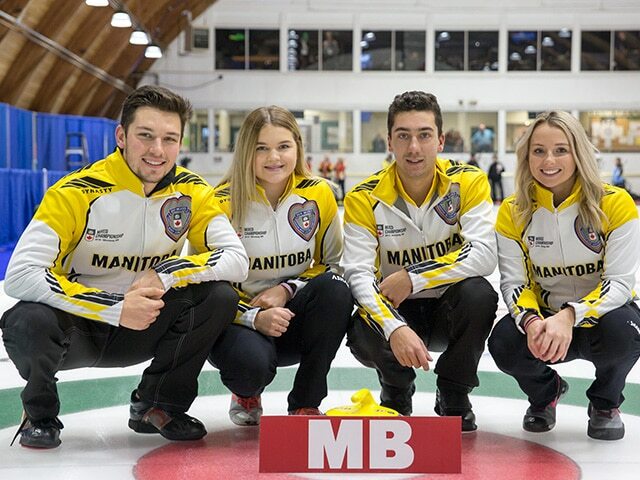 The Friday night entertainment at the 2019 Canadian Mixed Curling Championship in Winnipeg is a Manitoba Social. Manitobans will be jubilant to share their tradition with Canada’s other provinces and territories at the championship in the Fort Rouge Curling Club and there’s extra cause for celebration considering Colin Kurz’s hometown team locked up a spot in the playoffs. Kurz and his team from the Assiniboine Memorial Curling Club stole a point in the extra end against Nova Scotia’s Kendal Thompson to win 8-7. Kurz’s final shot, a guard, slid a little far but Nova Scotia missed it’s final tap attempt to give up one. Manitoba started the game hot against Nova Scotia, but couldn’t keep the the maritime province down for the count early on. After forcing Nova Scotia to one, Manitoba scored three points. However, Thompson and Nova Scotia scored a deuce the next end, followed by a steal of one in the fourth. Manitoba delivered quite the counterpunch in the fifth. After Thompson missed a double on his final shot, Kurz elected to play a split for three instead of a draw for two. The front guard – about a foot away from the house – was bumped into the 12-foot while the shooter rolled into the rings, regaining the lead for Manitoba. “I don’t know if we enjoy the pressure or if it’s a little more exciting to play those do-or-die games – we’ve had one in our last three games and were able to rattle a couple of them. It’s more the fact that we’re into it right now,” said Kurz of what’s driven his team to perform late in the national championship. Not to be outdone, Thompson threw a show-stopper shot of his own in the sixth end. Nova Scotia played a double-raise takeout perfectly, removing Manitoba’s shot stone to count two and tie the game 6-6. Nova Scotia continued in the seventh, picking up a steal of one and 7-6 lead heading into the final end, but without hammer. Manitoba scored one to force the extra end. Kurz, who represented Manitoba at the 2018 New Holland Canadian Juniors with second Brendan Bilawka, is enjoying the experience of playing a national championship in his hometown. “It’s a lot about the curling, but a lot about the experience as well,” Kurz said, noting the host committee is hosting a Manitoba social on Friday night. “I might have to have a beer after that game. An extra end usually calls for at least one beer,” he joked. Manitoba secured the second seed in the playoffs and will play Ontario’s Wayne Tuck (Ilderton Curling Club) in the 2 vs. 3 game. Tuck lost to Quebec’s Felix Asselin on Friday night, securing the top seed for his team from the Glenmore, Laval-sur-le-Lac and Baie d’Urfé Curling Clubs. Quebec chipped away at Ontario’s Tuck. Asselin scored one in each of the first three ends before Tuck made a draw to the four-foot in the fourth. Quebec had a 3-1 lead at the fourth-end break, but there was still more work to do. Quebec faced two Ontario counters in the fifth, but Asselin played the angles on a double just right, removing them both for one. Ontario took one in the sixth and Asselin relied on his double-making abilities to score in the seventh. He hit a straight-back double with his final shot to score three. Quebec took a 7-2 lead to win the game in seven ends and secure the top seed in the playoffs. Nova Scotia will play Quebec as the fourth seed in the playoffs. In other Championship Pool action, Saskatchewan’s Jason Ackerman (Highland Curling Club, Regina) defeated Alberta’s Kurt Balderston (Grande Prairie Curling Club). Alberta started the game with the hammer and opted to blank the first two ends. Balderston’s patience paid off, as he set up a score of three in the third end. But Saskatchewan wasn’t ready to be outdone. Saskatchewan’s Ackerman scored three points of his own in the fourth end to tie the game at the halfway mark. Saskatchewan also kept Alberta off the board in the second half, stealing single points in the seventh and eighth ends to win 6-3. Yukon’s Bob Smallwood (Whitehorse Curling Club) and British Columbia’s Cody Tanaka (Richmond Curling Club) battled in an entertaining back and forth affair. After forcing Yukon to one in the first, British Columbia scored a deuce with hammer in the second and stole a point in the third. Yukon scored one in the fourth, tying the game back up at 3-3 by the fourth-end break. British Columbia was forced to one in the fifth and Yukon opened the floodgates in the next end. B.C. missed an in-off on its last, leaving three Yukon stones in the four-foot. Smallwood packed another one into the rings to score four. But the British Columbia team was resilient. It scored three the following end to tie the game back up at 7-7. Smallwood ended the game in the eighth with a hit for two and the victory. The Seeding Pool also wrapped up on Friday. Mel Sittichinli of the Northwest Territories (Inuvik Curling Club) won his second game in a row. He defeated Ed MacDonald of Nunavut (Iqaluit Curling Club) 10-1. New Brunswick’s Chris Jeffrey (Gage Golf and Curling Association, Oromocto) finished with an 8-2 win against Newfoundland and Labrador’s Harold Walters (RE/MAX Centre, St. John’s). New Brunswick finished the championship 5-4, while Newfoundland and Labrador dropped to 2-7. Northern Ontario’s Trevor Bonot (Port Arthur Curling Club, Thunder Bay) also finished 5-4. He bested Prince Edward Island’s Melissa Morrow (Summerside/Charlottetown Curling Clubs) 6-4.